Germany had a plan for the battle of Verdun. They believed the French would fight, against all odds, to preserve historic forts in the Verdun region. Were that to happen, the Kaiser's troops could "Bleed France White," thereby winning the battle by attrition. The problem of winning a battle by attrition, however, is the staggering amount of human losses. After months of effort, during which the French people refused to give up, casualties on both sides were frighteningly high. 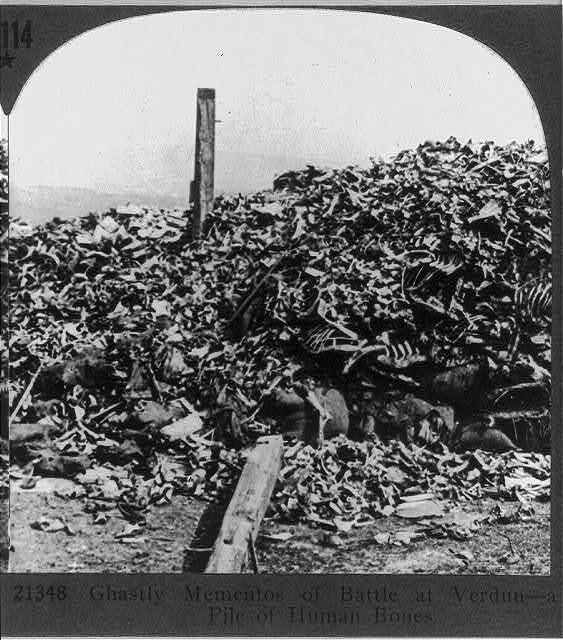 Entire villages [like Haucourt] were devastated, the surrounding fields ploughed by falling shrapnel, the air polluted with toxic gases [causing French soldiers, in the trenches, to wear gas masks] and woods destroyed leaving in their wake lunar landscapes of craters and trenches, in which the survivors took shelter. They would often fight for a few metres, bayonet to rifle, covered in mud, thirsty, asphyxiated and broken. Villages lost one day were won back the next; indeed, the village of Fleury-devant-Douaumont was captured and recaptured sixteen times, Vaux thirteen. The slightest overhang became an issue, with the front line never ceasing to move but not giving anything away either. The fighting would drag on for many more months (until the 18th of December, 1916). Casualties (killed and injured) were staggeringly high for both sides. Excerpted quote, "The Battle of Verdun," from the French-language website Verdun la Vie Communauté de Communes de Verdun - Ville de Verdun. Bos, Carole "Verdun - A Vicious Battle" AwesomeStories.com. Oct 07, 2013. Apr 21, 2019.